Prefers diplomacy to martial combat. 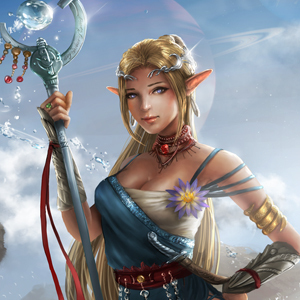 Mira is one of the leaders within the Sun Elf Council and she is well liked among her peers. She is very kind and within her city she has supported commerce and trade. She even was able to convince the Moon Elves to trade with her city. Little is known about her before her running as an official of the House of Arrain, but she has yet to create any major issues among the Sun Elf Council. Recently it was unearthed that she was married before running for office. She wedded with a Gentile of the House of Arrain, Polux Strongtide. He passed away shortly after the wedding in a disastrous accident. The details of which are unknown. Her son was kept a secret for a long time as he grew up hidden from the spotlight.